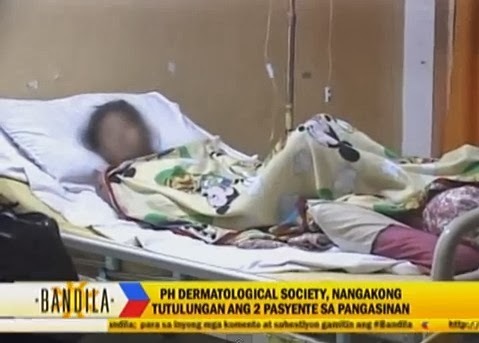 Manila, Philippines - The Dermatological Society North Luzon Chapter informed the public on Thursday thru a follow-up report of ABS-CBN's late night newscast Bandila that it will help the 2 patients with severe skin disease in Sta. Barbara and Villasis, Pangasinan. The patients were admitted in the provincial hospital few days after the controversial report of ABS-CBN was aired for the alleged mysterious 'flesh-eating' disease in Pangasinan. The organization said they will help the patients for the medical expenses. "We are very willing as a Philippine Dermatological Society na tulungan ang Pangasinan right now na magamot ang pasyente na baka may skin disease na pinagdudahan na mas malala", Dr. Bernadette Villaflor, President of PH Dermatological Society North Luzon Chapter said. In the February 24, 2014 video report of broadcast journalist Jasmin Romero, she interviewed two patients on their condition of which their family and ABS-CBN described them as having decaying (naagnas) skin due to a "mysterious disease (misteryosong sakit). The Bandila special report on Monday earned mixed reactions from netizens. Just few minutes after the Part 1 of the report was aired, it became a hot topic on social media relating the case to a prophecy of Vincent Selvakumar and Jesus Ministries founder Sadhu Sundar Selvaraj. In the afternoon of February 25, the local health office of Pangasinan announced that the public should not panic as they claimed there is no 'flesh-eating' disease in Pangasinan after a visual diagnosis. The severe disease of two patients are cases of leprosy and psoriasis according to the provincial health official. In the Bandila report, the family of the patient said that they have already asked diagnosis from several doctors in Manila and Baguio but none of them identified the type of disease of the patient. Due to poverty and having no access to good local health care, the condition of the patients became severe. Reports said that GMA Foundation also helped the patient before as it was aired in the primetime newscast '24 Oras'. However, there's no follow-up report if the disease has been cured. The news about mysterious disease was tagged by the Department of Health (DOH) a hoax. However, some netizens said that it somehow served as a 'wake up call' for the government to have a good medical service specially for those affected by rare disease. Without the Bandila report, medical assistance to the patients will not pour, some netizens said. A day before the international Rare Disease Day, Sen. Pia Cayetano announced she will push the passage of a bill that will mandate the government to assist persons with rare disease by increasing their access to medical treatment and drugs, and including them in the coverage of the Universal Health Care program.